Stretched to the limit Galactic Command scientists developed a new space craft that is lighter, faster and more powerful than any before it. Episode One begins with this new Engstrom class carrier's first day in a live combat engagement. Your Echo fighter squadron of fighters has been assigned to the WildStar battle fleet led by the GCV-Excalibur in operations against the Insurgent uprising. As an Elite Force Pilot and leader of the Echo fighter wing assigned to IIS starstation in orbit around Titan, your fighter squad is tasked with leading a series of defensive and offensive missions against the Insurgents occupying Sol territories. Unlike our other larger capital ship series (Battlecruiser, Universal Combat) Echo Squad SE takes place within the confines of the Terran Quadrant which spans the following star systems. So in sandbox mode, you are restricted to this quadrant. 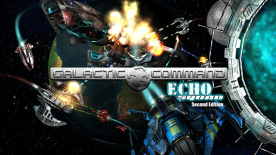 Echo Squad was first developed in 2007-2008 for Turner's GameTap service. When that service was sold off (to Metaboli), the game rights reverted. A few months later we decided to update and improve the game. It was later released in early 2009 as Echo Squad SE. The game uses our legacy game engine first released in 2009 for the original Echo Squad SE. The much larger Universal Combat Collector's Edition v2.0 game is also derived from this engine.